Offered as an introduction to the field of data structures and algorithms, Open Data Structures covers the implementation and analysis of data structures for sequences (lists), queues, priority queues, unordered dictionaries, ordered dictionaries, and graphs. Focusing on a mathematically rigorous approach that is fast, practical, and efficient, Morin clearly and briskly presents instruction along with source code in Python, Java and C++. 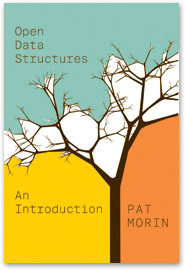 Pat Morin is a professor in the School of Computer Science at Carleton University as well as a founder and a managing editor of the open access Journal of Computational Geometry. He is the author of numerous conference papers and journal publications on the topics of computational geometry, algorithms, and data structures.